Numerous shoulder injuries occur after a high-energy trauma or repeated microtrauma in football players. Many lesions are described, and type of trauma, patient’s symptoms, player’s role, and optimal timing for surgical treatment must be thoroughly evaluated. Treatment of rotator cuff tears in athletes is challenging, considering the high level of activities and the need of a fast recovery and return to sports activities. In many patients a conservative treatment is initially proposed, consisting of shoulder immobilization with a sling for a brief period followed by a rehabilitation period. Surgery is indicated for athletes with severe pain and/or functional limitation and, if possible, is performed at the end of the season. Only 49.9% of professional athletes return to play at the same level after rotator cuff repair, and in partial lesions involving <50% of the thickness of the tendon, an arthroscopic debridement, followed by an accelerated rehabilitation protocol, is often recommended. After rotator cuff injuries, football players may return to their athletic activity in 5–7 months. 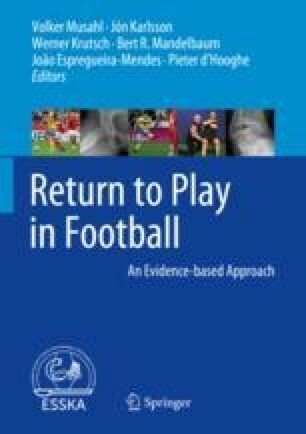 A good decision-based return to play relies on a three-step model assessment: evaluation of health status, participation risk, and specific aspects of the single case (decision modification).